"Kien's job is to search the Jungle of Screaming Souls for corpses. He knows the area well - this was where, in the dry season of 1969, his battalion was obliterated by American napalm and helicopter gunfire. Kien was one of only ten survivors. This book is his attempt to understand the eleven years of his life he gave to a senseless war." The world of modern fiction is already replete with classic war-based literature: Catch-22, All Quiet on the Western Front, Heart of Darkness, and Slaughterhouse-Five are just a few. One could argue that this leaves little to say; that the horrors of war have already been well-documented. 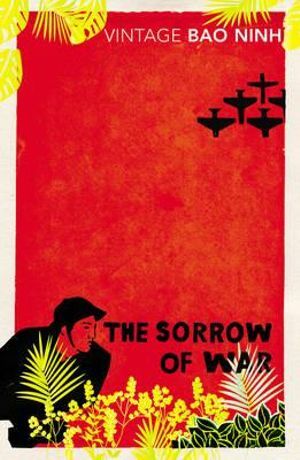 However, a book that has been banned by the Communist Party, has won the Independent Foreign Fiction Prize, and which leaves its author reluctant to publish further works is always going to be a source of intrigue, and luckily Bao Ninh's The Sorrow of War does not just disappear behind this smokescreen of hyperbole, proving comparable in quality to the classics hitherto mentioned. This high quality of work perhaps comes from the adage that it is best to write what you know; The Sorrow of War is based strongly on Ninh's own experiences in Vietnam, and thus the line between fiction and non-fiction begins to blur, with the novel raising compelling questions regarding dreams, hallucinations, and the imagined versus reality, as well as the reliability of protagonist Kien as narrator and the extent to which we can rely on our own memories. We also wonder, as readers, in what context Kien is retelling his story, and frequently question the chronology of the story itself, which doesn't make the plot unclear in any way, but rather opens the door to many future rereadings, so that readers can piece together the narrative in any number of new and different ways. The piecemeal narrative is enhanced by the strength of the imagery and technique used by Ninh, which is elegant yet accessible throughout, while remaining simultaneously beautiful and ugly as he treats the sheer brutality of conflict with frankness and economy of style. In this way, he emphasises the worthlessness of human life, the ability of war to doom love, and the unforgiving aftermath of such bloodshed. The philosophical elements of this - such as whether ex-servicemen can ever be truly free post-war, and how far the characters in The Sorrow of War are acting according to their 'real' personalities - again make this work worth revisiting. Even though the novel's title is so often reiterated throughout the novel as to seem contrived (Ninh has already shown us the sorrow of war; he does not need to tell us), the haunting themes, terrifying incidents, and compelling characters also contribute to this 1990 novel's status as a modern classic. Even the most briefly depicted personages are memorable for what the continued fighting has done to them, and the veiled references to the genre's forerunners (such as the emphasis on landscape, which is shared with Heart of Darkness) only emphasise The Sorrow of War's originality and flair, rather than detracting from it. It is therefore well deserving of its place in the literary canon, and one only hopes that Ninh will continue to publish what is surely a valuable extension of this highly significant Vietnamese view of one of the most tragic episodes in the country's history.